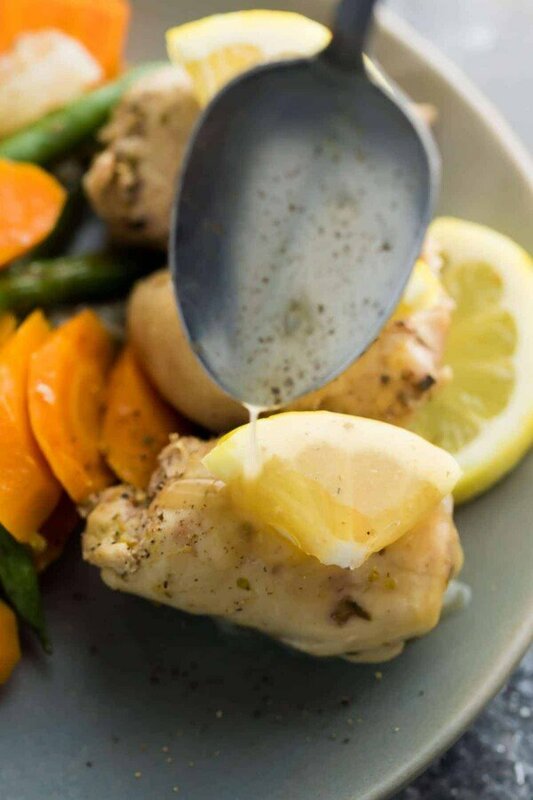 Assemble these freezer to slow cooker lemon garlic chicken thighs ahead and stash in the fridge or freezer until you’re ready to cook up! This recipe provides a delicious lemon garlic sauce you’re going to want to drizzle on everything. The more I think about it, I just can’t help but be grateful for growing up in the 90’s. Typical summer in the 1990’s: late-night summer kick the can with the entire neighborhood. Setting up a cupcakes and lemonade stand at the end of my drive way. Heading to the movie store on a (nearly) nightly basis to pick out a 99 cent movie. Bike rides to get slurpees. Jumping on a friend’s trampoline all. day. long. My family was pretty outdoorsy, and we did lots of camping, hiking and road trips. I have the absolute best summer memories! The weather is warming up, and I get so optimistic. Kai is still young. Technology does not have much of an impact on him yet. I want Kai to have a 90’s style summer while he still can, so this summer we are spending every possible second outside. We are going to go hiking, fishing and camping. And lots of bike rides! We are going to stay up later for family movie nights. We are going to soak up every ounce of sunshine and make this a summer to remember. Those are my summer resolutions. Do you have any good 90’s summer memories? Let me know! 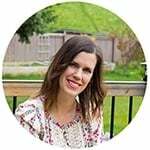 If you’re looking to spend as much time outside as possible this summer, then you might be interested in the meal prep dinner recipes I’ve been sharing on the blog lately, and maybe also in these slow cooker lemon garlic chicken thighs…because they make dinner E-A-S-Y! This is another freezer to crock pot recipe…meaning you can assemble all the ingredients ahead of time and freeze them. Then, when you’re ready to cook them up, thaw overnight and dump everything into the slow cooker with a bit of chicken stock. Bam. That’s it. Get back outside and let your slow cooker do all the hard work. My kinda dinner! 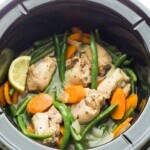 These slow cooker lemon garlic chicken thighs cook up with some carrots and onions, and I decided to throw a couple of handfulls of green beans on top for the last 30 minutes. You could also add some broccoli or snap peas, they’d go wonderfully with the flavors in this recipe! After everything cooks up, you pour out the liquids and make a quick sauce of them. I tried adding the cornstarch directly to the crock pot, but this was a little bland in flavor, and the sauce really benefits from simmering down for 10 or so minutes. That’s it. For your efforts, you are rewarded with delicious chicken thighs, veggies and a sauce. Serve with some potatoes or rice, or just a bit of bread to soak up your extra sauce. 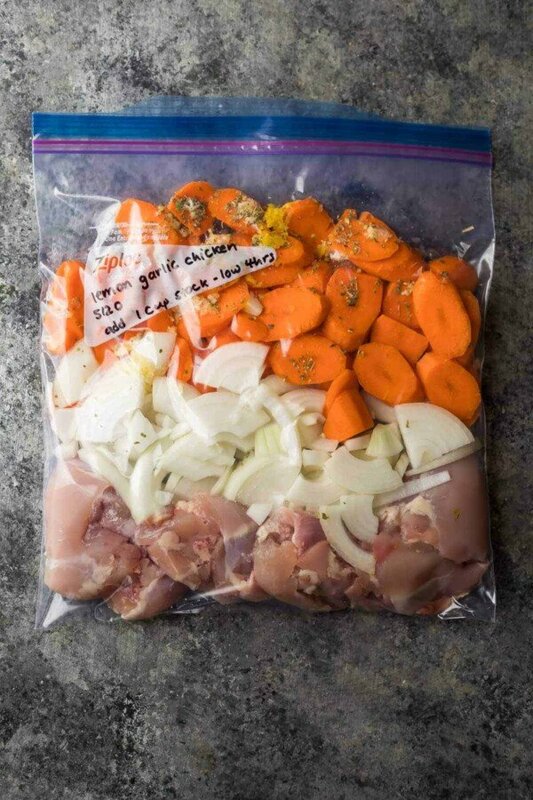 Assemble these freezer to slow cooker lemon garlic chicken thighs ahead and stash in the fridge or freezer until you're ready to cook up! This recipe provides a delicious lemon garlic sauce you're going to want to drizzle on everything. 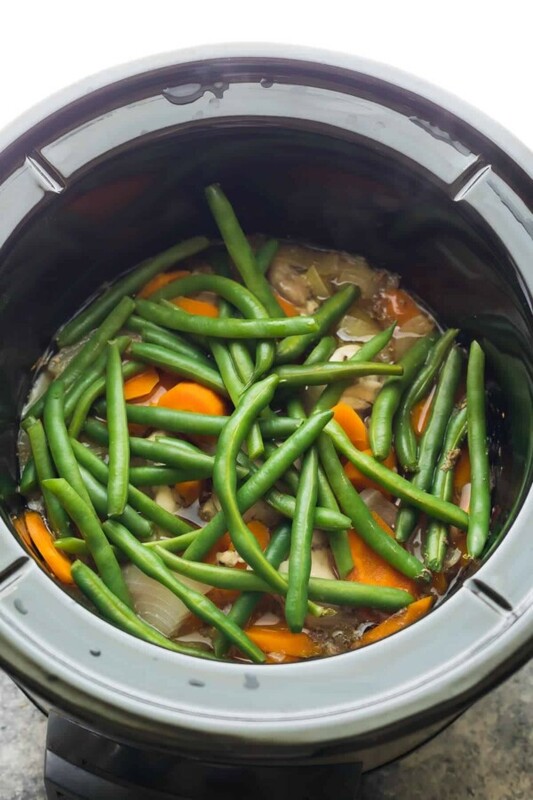 In the base of a 4-5 quart slow cooker, combine all the 'add to the slow cooker' ingredients. Stir and cook on low for 4-5 hours, or for high 3-4 hours. 30 minutes before serving, add in the green beans, butter, lemon juice, and cornstarch/water mixture. 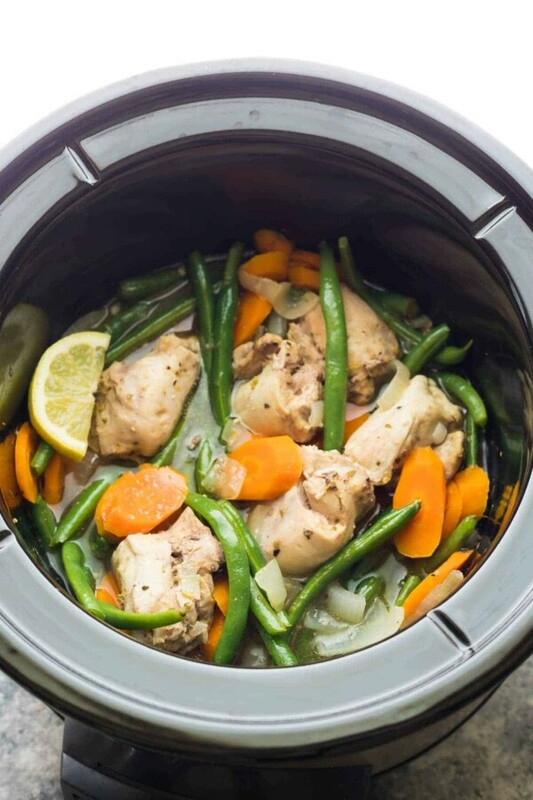 Turn slow cooker to high and cook for another 30 minutes. Serve the sauce spooned over chicken and veggies. 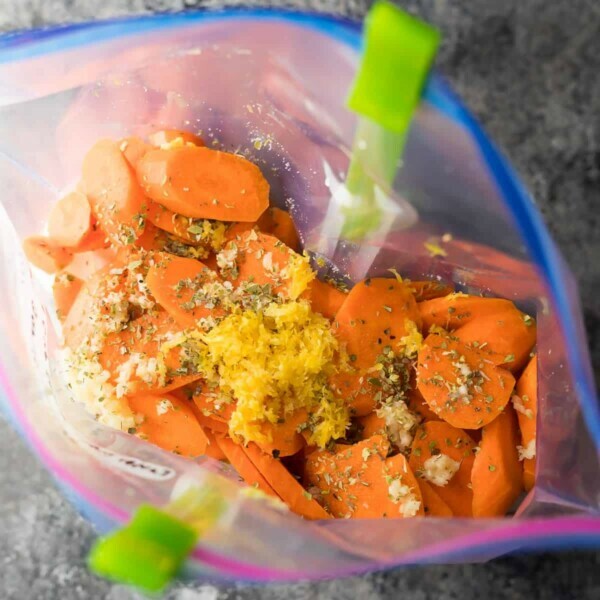 In a gallon sized freezer bag, combine the chicken, carrots, garlic, salt, oregano, onion, and lemon zest. Thaw overnight in the fridge the night before cooking. 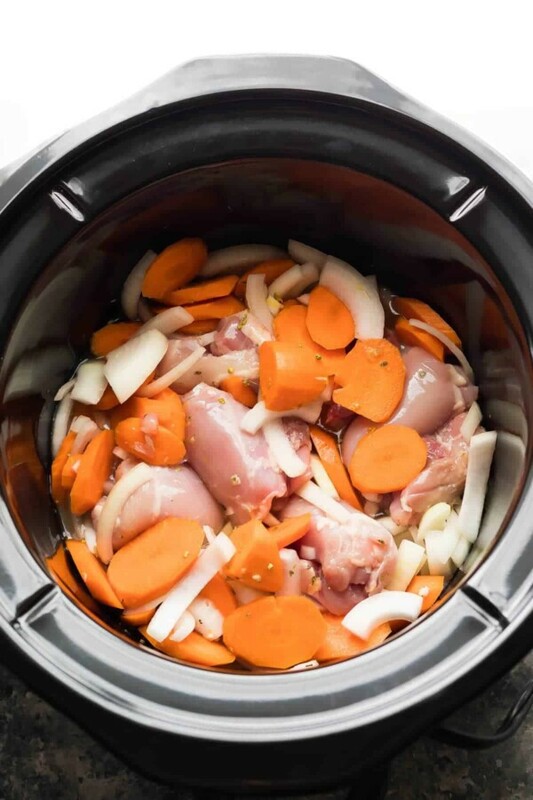 Dump all ingredients in a 4-5 quart slow cooker and add 1 cup chicken stock. Cook as indicated above. The sauce was every bit as delicious as advertised and the chicken thighs cooked on low for 5 hours were fall-off-the-fork tender. But adding fresh cut green beans on high 30 minutes before serving did not work; they were more uncooked than crunchy tender. I think I would either add the green beans much sooner or go with frozen peas. It was just a minor deficiency in the recipe! I’ve already shared it with friends, and leftovers were every bit as yummy. After 2.5 hours at highy chockem was terribly overcooked..
Hi Maddy, sounds like you have a slow cooker that cooks really hot. Which brand are you using? Also, did you use boneless skinless chicken thighs? 2.5 hours on high should definitely not overcook thighs. How many minutes before serving? Hi Nancy, sorry about that, I think some information went missing when I swapped recipe card plugins. It should say ’30 minutes before serving’. Thank you for catching that! You can add it in with the cornstarch & water. I’ll amend the recipe! May I ask you to clarify the use of lemon juice and cornstarch? Do you use any lemon juice during the cooking? The ingredient listing calls for 4 teaspoons of each but the directions call only for 2 teaspoons of each to make the sauce. It isn’t clear to me what happens to the other 2 teaspoons of lemon juice and cornstarch. Perhaps I missed a line? can thighs be replaced with breasts? my hubbys not a fan. Hi Tabatha! I haven’t tried this exact recipe with chicken breasts but it should be fine. I would check on them at the earlier time points, though, as chicken breasts are easy to overcook in the slow cooker. I hope you enjoy! Would this work in an Instant Pot too?! That would be amazing. Hi Nicole, I’m not much of an expert in Instant Pot Cooking. I think it should work, but can’t say for sure. Yum! I can’t wait to give it a try!